Multiple sclerosis is a demyelinating disease in which the insulating covers of nerve cells in the brain and spinal cord are damaged. This damage disrupts the ability of parts of the nervous system to communicate, resulting in a range of signs and symptoms, including physical, mental, and sometimes psychiatric problems. The name multiple sclerosis refers to the scars/plaques in the white matter. Loss of myelin in these lesions causes some of the symptoms, which vary widely depending upon which signals are interrupted. When the myelin is lost, the neurons can no longer effectively conduct their electrical signals. Several factor that include heredity, infection, smoking, alcohol consumption, environmental factors and mental stress leads to the development of multiple sclerosis. 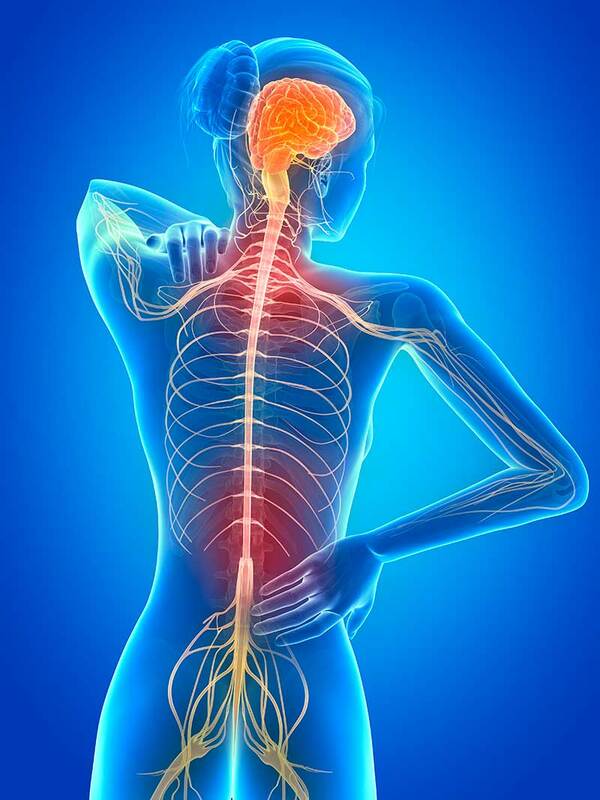 The factors may lead to the alteration of the nerve flexibility of functionality leading to the disease condition. In Ayurveda multiple sclerosis can be correlated with “Avrutha/avarana vata”. In Ayurvediya Shabdakosha “Avarana” is defined as Avarodha, Gatinirodha i.e. Obstruction or resistance or friction to the normal gati of Vata. So the word “Avarana” can be understood as Acchadana (covering), Avaruddhagati (obstructed movement), Sanga (obstruction), Peedhana, Akriya (loss of function or immobile), Pracchadana (stagnate). In Ayurveda, the root cause of multiple sclerosis is a body energy disorder. When the basic principles or dosha are altered or changed, it causes various symptoms. When the body system balance is lost, it can lead to improper digestion and formation and accumulation of toxins in the body. the accumulated toxins cause blockage in the minute channels of the body thus obstructing the movement of body energies, giving rise to neuro-muscular disorders. If left untreated these blockages can be fatal resulting in permanent damage of nerves and tissues. In Ayur Bethaniya Ayurveda Hospital, we believe in eliminating the root cause of any disorder and thereby prevent the reoccurrence of the disease in the body. Our Ayurvedic treatment plan consists of the procedures to eliminate the toxins and restore the digestive mechanism using combination of unique herbal formulas. Herbal decoction that aids in proper digestion and removal of bocks in the nervous system rejuvenates the body and improves the blood circulation system. It also brings in harmony and balance in the basic principles of the body. Along with the treatment procedure, the doctor also instructs to adapt few lifestyle modifications with proper diet and regimen to restore the function of the nervous system. At Ayur Bethaniya Ayurveda Hospital, our treatment plans are customized as per patient health condition and include oilmassage using herbal oil and specialized treatments that aids in internal cleansing of various body system. The treatment duration depends on the severity of the condition and may range from for 3 to 5 weeks to create an ideal and balanced internal physical environment for faster healing and recovery. The treatment plan cleanses the areas of toxins and blockage that cause the symptoms of multiple sclerosis. At Ayur Bethaniya Ayurveda Hospital, we provide safe and effective herbal treatment plans that are customized as per individual patient condition to treat and recover from numerous skin diseases. We ensure complete recovery from the symptoms caused by the disease condition through cleansing and rejuvenating the body, mind and soul to feel a better individual. To know more about multiple sclerosis treatment method and treatment cost, book an appointment now.